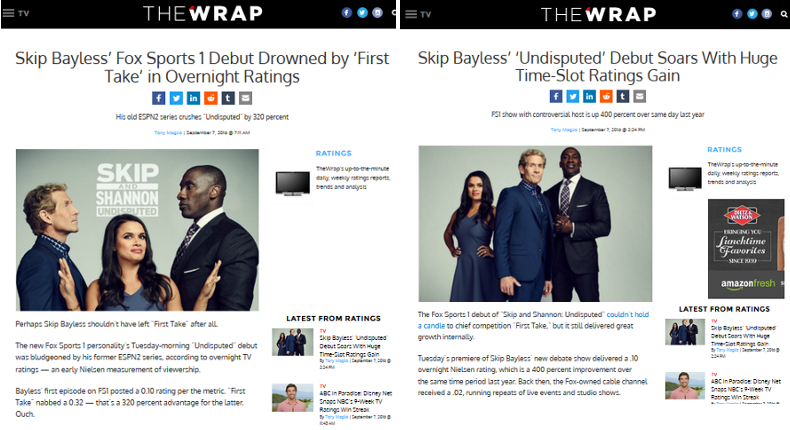 TheWrap says Skip Bayless' debut both "drowns" and "soars"
Looks like there was a plea to spin. It would be surprising if the debut of a new show of any sort didn’t beat reruns in its timeslot, much less one Fox has spent this much time and money promoting. Regardless of if there was a “plea” or not, Maglio’s later story is an incredibly favorable spin on a 0.10 overnight, and the percentages indicate that; it’s much easier to be up 400 per cent when the first number was tiny in its own right. There’s no problem with reporting how this show compares to the reruns Fox previously had in that slot, but why would you write that as a separate headline with a story that makes this seem like a success for Fox? One rating (and an overnight to boot) doesn’t necessarily doom this show, but it’s hard to see how anyone outside of Fox PR headquarters can interpret this 0.10 as a success of any kind. To TheWrap’s credit, they’ve kept both stories online and linked both to each other. This would look much worse if they’d deleted or edited the initial critical story, and it’s still there (and linked in the prominent “Latest TV” stories sidebar on the right of the new story). The new story also mentions how First Take‘s ratings were still way better than Undisputed’s. Still, not everyone’s going to click through a link or read beyond a headline, and media headlines need to be responsible and accurate. It’s hard to justify “Skip Bayless’ ‘Undisputed’ Debut Soars With Huge Time-Slot Ratings Gain” as a headline if you don’t work for Fox.